On Christmas Eve, my family always has a soup bar with crockpots lining the counter with delicious options! This year I am making my sausage kale soup! The hearty sausage and savory broth that clings to every nook and cranny of the kale is mouthwatering. It warms you to the bone and is an absolute must this holiday season! Every year, my giant extended family has a soup bar on Christmas Eve, where everyone brings a soup or side dish. The kitchen counter is lined with slow cookers steaming with hot soup! 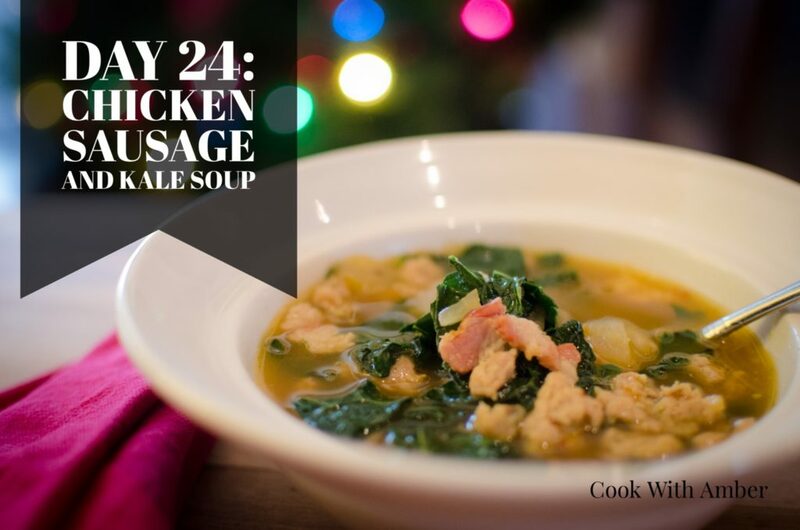 This Chicken Sausage and Kale Soup is always a hit. By the end of the night, the pot is scraped clean and everyone is happy and full. 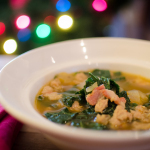 I use chicken sausage and a little bit of nitrate-free bacon to give this soup lots of extra flavor. It’s so delicious and the all the amazing flavor soaks into the kale. Bonus: kale adds vitamins and fiber too, helping to fight disease! This soup is truly amazing! In a large pot or Dutch oven, cook the bacon over medium-high heat until crisp. Scoop out the bacon and set aside on a plate lined with a paper towel. Add the sausage to the bacon drippings in the pot and cook through until crumbly. Remove the sausage and add it to the plate with the bacon. Leave a few tablespoons of drippings in the bottom of the pot. Add the onion and garlic and cook until the onion is and translucent. Wash and stem the kale. You can do this by holding the stem with one hand and running the other hand down the stem from base to tip, ripping off the leaf in the process. Tear into bite-size pieces. Add the chicken stock, as well as the bacon and sausage, to the pot and bring to a simmer. Add the kale just before serving and mix until it wilts. Season with salt and pepper, and enjoy. In a large pot or Dutch oven, cook the bacon over medium-high heat until crisp. Scoop out the bacon and set aside on a plate lined with a paper towel. Add the sausage to the bacon drippings in the pot and cook through until crumbly. Remove the sausage and add it to the plate with the bacon. Leave a few tablespoons of drippings in the bottom of the pot. Add the onion and garlic and cook until the onion is and translucent. Wash and stem the kale. You can do this by holding the stem with one hand and running the other hand down the stem from base to tip, ripping off the leaf in the process. Tear into bite-size pieces. Add the chicken stock, as well as the bacon and sausage, to the pot and bring to a simmer. Add the kale just before serving and mix until it wilts. Season with salt and pepper, and enjoy.